Recently, we had an inquiry from a new HART Outdoor customer asking about the Wound Wipes found in the kit. Maria wanted to know what Wound Wipes are and how to use them. Very good question Maria. Wound Wipes are an essential component to managing minor wound care especially when soap and clean water are not available or in limited supply. Each towelette contains Benzalkonium Chloride (BZK which is an all-purpose antiseptic that helps to clean and remove germs to help prevent infection. Wound Wipes are alcohol-free premoistened towelettes that clean without stinging and do not cause damage to fragile skin tissues. We include Wound Wipes in our First Aid Kits because we understand the importance of minor wound care. A complete care routine includes assessing the wound. If it doesn’t need professional care and there is little to no bleeding the next step is cleansing the wound. Allow the wound to dry, then applying the HART TRIBIOTIC(antibiotic ointment, same as Neosporin) is recommended by many first aid authorities. Cover with a sterile adhesive bandage or for larger areas affix a non-adherent pad with tape, a non-adherent wrap, rolled gauze or an elastic bandage. Following these steps helps prevent most minor wounds from becoming infected. If the wound is oozing or bleeding for more than a few hours see a professional. In a pinch Wound Wipes may be used as a hand, surface, or instrument sanitizer as well. We hope this answered your question Maria and thanks for asking. 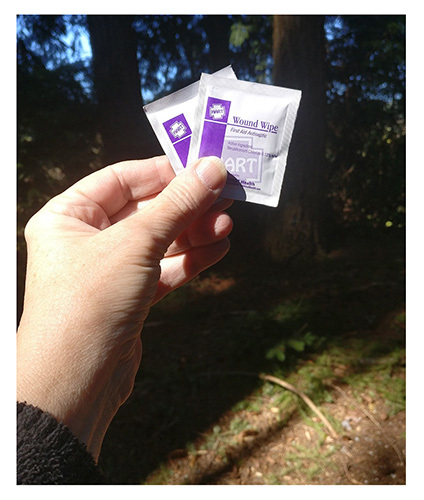 Please return to this blog again for more information about your HART Outdoor First Aid Kits. We highly recommend a first aid course for every adult; a wilderness course is important if you spend time long distances from emergency help. You will find many answers in our wilderness manual for first aid treatment, but it is best used in conjunction with training. Be sure to review your wilderness manual regularly to be familiar with the location of various types of first aid care that you may encounter.